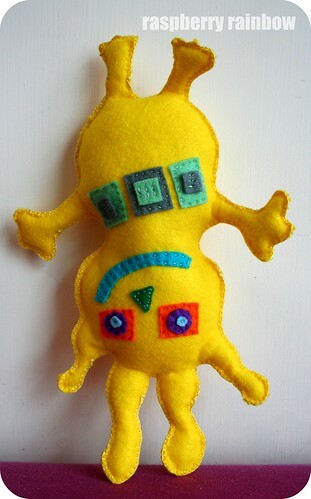 This week in my Creative Space, I have been busy making an alien. A happy alien who loves to do yoga. See, he loves it. My yoga loving alien was almost a huge craft fail. In my mastitis effected state, I kind of forgot felt is not that easy to turn inside-out when sewn into fiddly shapes like little alien feet, hands or head appendages. I had to unpick all my sewing, cut off the seam allowance, then sew him back up again, this time on the outside, using blanket stitch. I am so glad I could save him as I spent a very happy afternoon, during Zoe's nap time, hand sewing on his face and tummy detail. 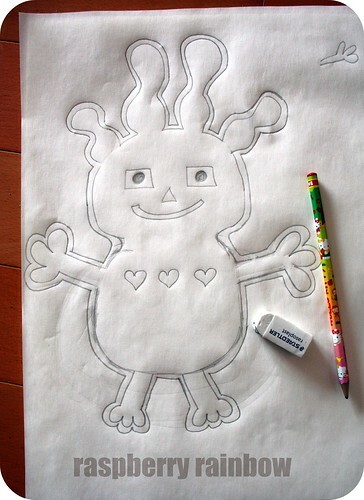 Here is the happy alien, right way around, with a little help from my assistant (2 year old Zoe). 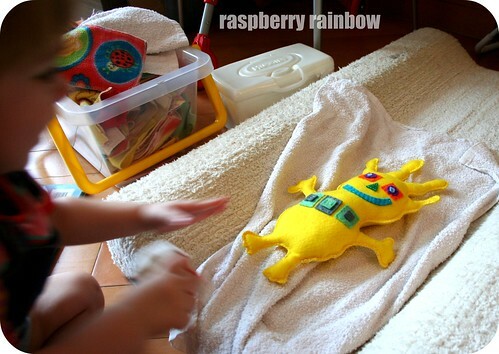 My assistant also thought happy alien needed a nappy change. Aawwwww, too cute me thinks. I am going to have to sneak the happy alien and my little squishy butterflies out of the house so I can post them to Pip for the Softies for Mirabel drive. Both my girls love them, and would happily have them as their own. Have a lovely Thursday, peeps. Cute! Love the yellow, and the great smile. How cute is this guy?!!! Adorable . He is sure to get many hugs! His yoga poses are impressive! Very very cute. 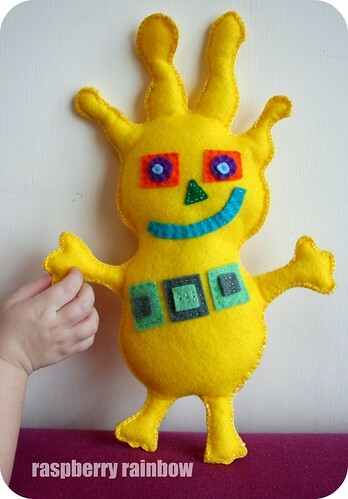 I love anything made of felt! Too cute! The yogi and the assistant. I've been loving everything about felt the last week. Sorry to hear you have mastitis. I can imagine how that must feel. Also I have a Zoe too, a little three month old Zoe. Great choice of name, te-hee. I didn't even know you could get mastitis so long after weaning. Hope making that yoga alien has you feeling better! Aww! What a cutie. And so many hands and fingers to grab on to! Lovely! Great softies! I know they'll be truly appreciated. Great design! I actually think the blanket stitch on the outside works perfectly - I couldn't imagine him any other way. A happy accident, perhaps (or not so happy, when I consider the unpicking - ughhh! ).